A frosty 5:30AM start saw us pulling up at the tennis club in Ruthin by 8AM ready for signing on. 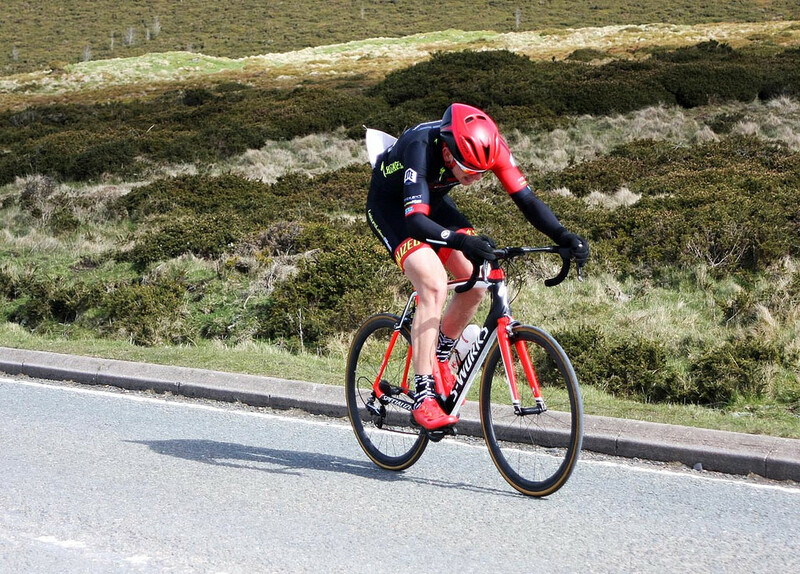 My first real road race was to be the North Wales Road Race Round 1: 95km and 1350m climbing with a hilltop finish at the top of Horse Shoe pass. There were a few early attacks from the flag but nothing major until Gareth went up the road with a group in the first breakaway of the day. This was brought back after about 25km and the pace in the peloton was pretty leisurely, despite the hills to my surprise. Being a rider on the heavy side I thought the elevation gain of the race would work against me but it turned out that other than the final 2 miles up to the finish the gradients were never too punishing and actually suited me quite well. A few kilometres later Adam went off in the next attack and I was positioned at the front of the peloton with Craig and we were more than happy to let the pace drop to allow Adam and his group of escapees to gain an advantage. A strong head wind down the far end of the course eventually saw this breakaway swallowed up by the peloton. Almost immediately at the top of the Nant Y Garth Pass (for the second time) another group broke free. They got about 200m down the road and I decided to try and chase them down for no real reason other than wanting to stretch my legs a little after seeing Gareth and Adam have a go. After a 5 minute chase I managed to bridge the gap and now we had a group of 5 riders who immediately settled into a comfortable through and off. I actually found riding in the breakaway at a constant higher pace easier than the constant stop start of the peloton. So we now had about 45km left to race and a lead of around 1 minute. Things didn’t look hopeful but we started working very well together with everyone taking proper turns so we just settled into it. An hour of through and off later and we were hitting the base of the Nant Y Garth Pass for the third and final time with a lead of ninety seconds. I didn’t feel too hopeful at this point as I knew the quality of the field behind. However I decided that the best way forward for me would be to increase the pace and go for a sustained effort to the top of Horse Shoe pass. This seemed to work as half way up the climb we had lost 2 of the 5 riders and now there were only three of us. I had a feeling that the peloton would be baring down on us now and it turned out that we had one minute from the base of the final climb. 2 miles and 60 seconds gap. One of the breakaway riders put in a big effort and put about 100m into us very quickly. I looked over my shoulder with about 500m to go and there were some escapees from the peloton only 50m behind with the whole peloton close behind that – this was going to be very close. A shout from a supporter confirmed we had 200m to go and I could finally see the finish line, however there was a steep finish with a big head wind which does not suit me very well. Unfortunately I was passed by a group of 4 riders with 100m to go and didn’t have sufficient kick to catch back up with them. I couldn’t let up though as the peloton was very close now. I managed to hang on for sixth place and collapsed on the floor at the top. Given I didn’t expect anything going into this race I’m absolutely chuffed to walk away with my first points for Team Chronomaster. Here’s to the rest of the season! Well done to James Smith (Team Aspire) for winning the race,Velo Club Melyd for putting up such a cracking race and Stephen Stuart for the photos. 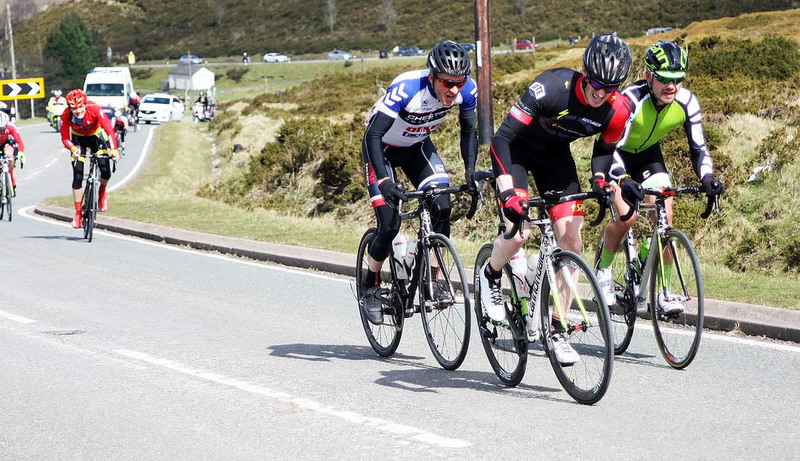 This entry was posted in Results and Reports and tagged Adam Baines, Craig Batters, Gareth Balshaw, Nick Pilling, North Wales Road Race Series, Paul Beech, Stephen Feeney. Bookmark the permalink.